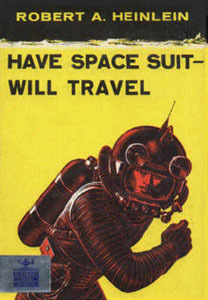 Have Space Suit—Will Travel by Robert A. Heinlein, was originally published in 1958. This is not exactly hot off the presses but I liked it so much, I figured I would return to the blog after my hiatus with something unexpected. Clifford “Kip” Russell wants to go to the moon. The story follows Kip as he works hard to enter a contest to go to the moon. Ultimately he does not win the trip but a used space suite instead. He works hard to fix the space suite and makes it functional. (This part was kinda boring but once you get passed this, the story really picks up.) While wearing the suite one evening, he inadvertently radios a flying saucer that is being piloted by young human girl, who has escaped her alien captors. Patricia Wynant Reinsfeld, better known as Peewee, thought she had reached safety when she found Kip but, for the most part, Kip is useless when it comes to battling aliens. Shenanigans ensue. Peewee is easily one of my favorite characters of all time. It’s the 1950’s so I get the need for a male protagonist but Peewee really makes this novel shine and for me personally she carries the story. Kip is kinda useless, which is nice to see from a 1950’s novel. For the most part, Have Space Suit—Will Travel has stood the test of time. I would definitely recommend it if you like Science Fiction. This entry was posted in Adult Fiction, Science Fiction, Young Adult and tagged Adult Fiction, Have Space Suit—Will Trave, Robert A. Heinlein, Science fiction, Young Adult. Bookmark the permalink.